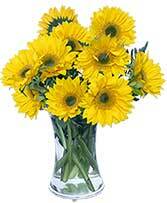 Three cheers for sunny yellow! 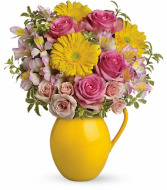 A happy pick for men and women, old and young, this sweet, summery arrangement of yellow and white flowers is delivered in our signature Sunny Day Pitcher - a keepsake piece that's perfect for lemonade and barbecues later on! 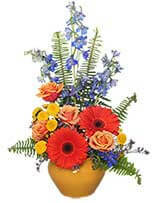 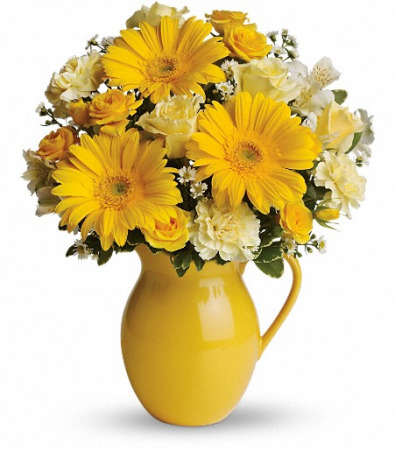 Yellow gerbera daisies, roses, alstroemeria and carnations are mixed with white monte cassino asters and green variegated pittosporum in a yellow ceramic Sunny Day Pitcher.